Coffee time at the office is now as easy as instant coffee (a definate no no) and better than drip coffee (no longer good enough). I have always been against the idea of Nespresso because they choose your coffee for you. The photograph shows the many blends on offer. However the feeling of smelling the beans as they’re being ground is quite literally worth jumping out of bed for. My current machine, which is amazing, takes a little too long between phone-calls and meetings. 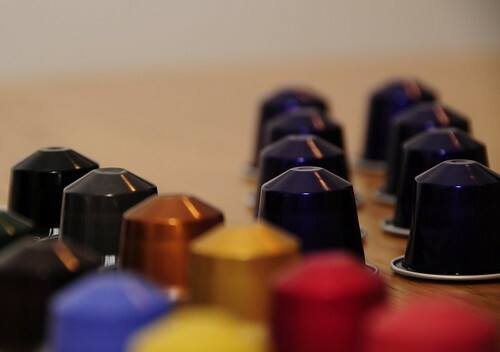 The Nespresso on the other hand, using the ready capsules, is ready after pressing one button! You can’t argue with that. That sounds nice, where can you get those machines? I am not a coffee fan but I love the Nespresso machines and concept. We do own one and we always order capsule, here in London they got the Nespresso bar as well. Its also nice when they do limited edition flavors, like on Xmass and other occasions. Oh, the smell! Even my husband, who doesn’t like coffee, loves that fresh ground smell! Yes. Without meaning to advertise… It is very convenient. Patrick (comment above) emailed me the address below for your info. I bought it from their online shop and delivered it via Aramex. You’re right. The concept is good. Restricting in a way – but very convenient. The smell is the best… My wife is the same. She doesn’t drink the stuff (thinks I torture myself drinking it) and loves the smell. We used to get the capsules from Paris way before NASCO GENERAL TRADING & CONTRACTING started this business locally and i can tell you that it taste much better and at 1/3 of the local cost. I ordered them from the UK. 25p a capsule and they don’t weigh much so Aramex charges were ok.
7ayyak… Ma sawaina shay… Good luck I hope you enjoy.